As marketers we’re always looking for new ways to take our Inbound strategies to the next level. When you’re on top of your game, you’re planning and executing campaigns and pushing out blog posts like it’s your job (oh wait, it is). In the midst of keeping your blog current, fresh and relevant to your readers, with all the latest tips and tricks; getting ahead can be a challenge. The best marketers are always looking one step ahead, but between managing your business blog, planning your next campaigns, and reviewing your monthly metrics, it’s easy to get overwhelmed. And let’s face it, even the savviest of marketers need a little break and relief from all of their responsibilities. But how? 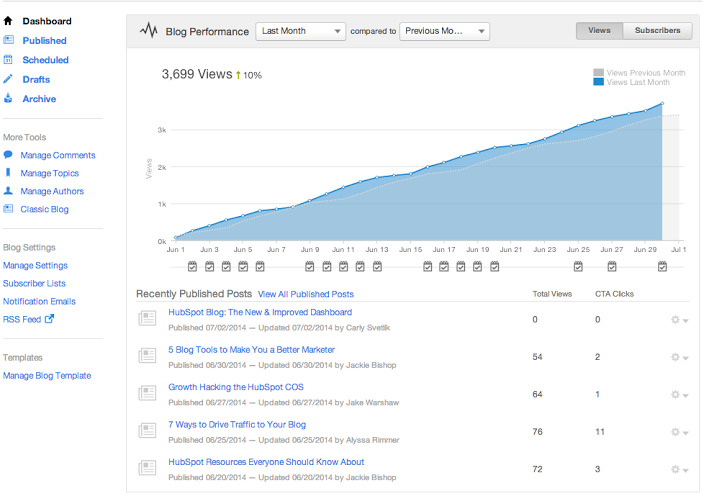 When it comes to blogging, HubSpot’s new blog dashboard is the answer. 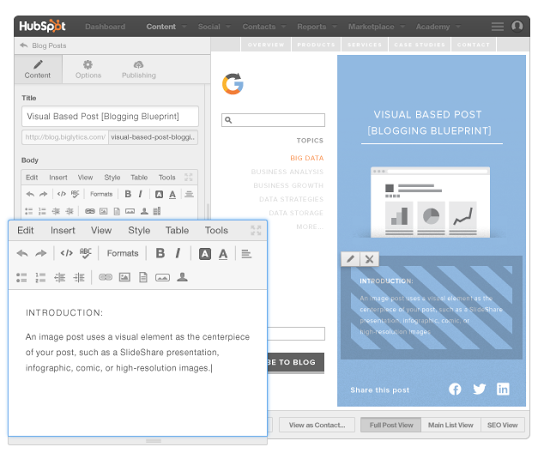 Enter HubSpot’s savvy new blogging dashboard. HubSpot knows how important blogging is which is why they have specifically designed the software to make it easier for us as bloggers. And if you haven’t already noticed, HubSpot’s blogging dashboard has had a makeover! Right in your portal, you now have access to everything you need to see, all in one place. The dashboard gives each user (whether that’s you as a marketer, your campaign managers or even your authors) the ability to manage topics, change their blog settings, access design features, and engage with readers. Graph your blog performance: See how each post is doing over time and how it impacts your top of the funnel efforts. Take a further look into specific dates: Doing this will help you see what post you published on a certain date and if it led to an increase or decrease of views or subscribers. View recently published posts: You will have easy access to your recent posts, the number of views and the number of hits your CTA received. View recent comments: This new function will let you see your recent comments and make it easy to manage all pending comments and replies. Access a useful sidebar: This sidebar will help you with all your blogging needs, including providing easy access to your blog and design settings. Switch between different blogs: If you have more than one blog in your portal you can easily switch between them using the drop down in the top left corner. Faster load time: Your data will be loaded much faster in this new dashboard which helps us be more efficient and stay on task. Organize blog posts into separate lists: Each of your blog posts will be separated as a published page, scheduled, drafted, and archived post to help you be better organized. Access three new blogging blueprints: These templates are available to you to create content in an easy and quick manner. “How-To” Post: This post should generally teach your reader how to do something through a series of steps. This blueprint can be used to explain a specific concept or process to your reader. “List” Post: This type of post is based off of a list consisting of a series of numbered or bulleted items surrounding your topic. This is a great template to use if you want an organized structure to help your content be easily scannable and concise. “Visual” Post: If you want your post to have a visual as the centerpiece than this is the template you want to use. This blueprint provides the format you should use to ensure that your visual component stands out from your copy. These blogging blueprints really break out the structure for each of your blog posts with useful information to help you determine where your content needs to go. Consider getting comfortable with each template so you know what post could benefit the most from the three you have offered. If you feel that a template may not work well with the content you have on hand there will always be a blank template available to you. We hope these additions to your dashboard will help you to take your content creation and blogging strategy to the next level. We can’t wait to continue writing blog posts with the handy new dashboard functions, and would love to hear from you! Have any questions about your new dashboard or blog blueprints? Let us know in a comment below!